Hello! Today I have the Festival Survival Kit from iZ Beauty of London to show you - consisting of a gel effect polish, UV topcoat, sheet of nail wraps, glitter pot, and tube of Dr Paw Paw balm. There are four different colour kits to choose from - with the glitter and wraps coordinated to your chosen colour. I have the orange box. Read on for more info! The four polishes are all from the Festival Fever Collection released from Summer 2017. I have swatches of both the blue and purple here. The polish in the orange box is 'Sold Out', a creamy orange. It has a smooth and easy to apply formula. I had a few streaks on my second coat so did add a third. Below is three coats with topcoat. 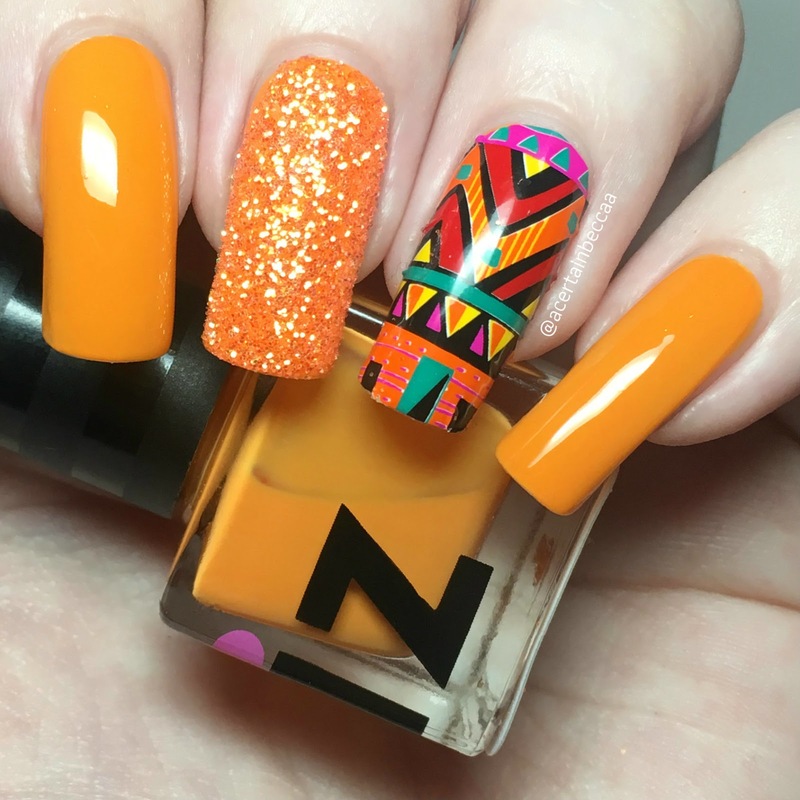 The glitter pot included is in the colour 'Tangerine Terror', described as a 'bright orange glitter with a yellow sparkle'. It is completely safe cosmetic grade glitter, and can be used on your face, body, and hair. The Dr Paw Paw balm can be used to stick the glitter down. The glitter can also be applied over polish, and the balm used on your nails and cuticles. The wraps in the orange box are the Aztec Inspired design. 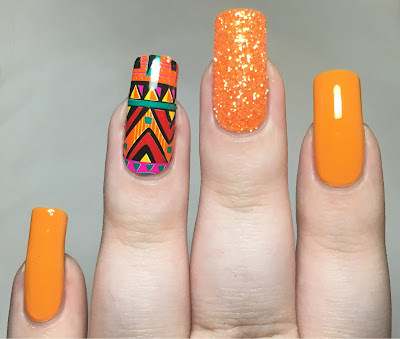 These are no heat nail wraps that are easily stuck onto the nail like stickers. A nail file is included in the packet to help file any excess length off. These are generously sized, and easily fit my long nails. Last up is the UV Topcoat. This is completely clear in normal lighting so can be used as a standard topcoat. Under UV/black lights, it glows brightly. You can see the glow below, both in the bottle itself and as a topcoat over my middle and ring nails. I created a quick mani using several of the items. I painted all of my nails with 'Sold Out'. I added one of the nail wraps onto my ring finger. I have quite curved nails so I did have a wrinkle or two, but they were easy to smooth out. I then added the glitter onto my ring finger by sprinkling it into my topcoat and dusting off any excess. What do you think? I think this is a great kit, and I love the mani I created! There's so many different ways you can use the items, whether it's for quick summer nails or for the full festival look. 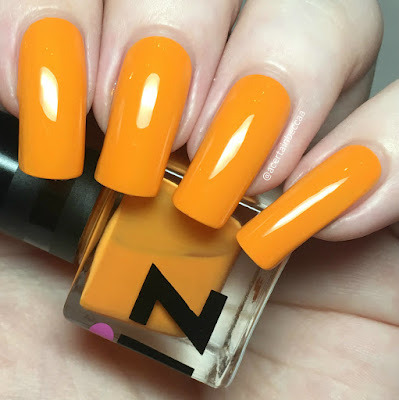 I also think that the items can easily be used throughout the year - the UV topcoat would be perfect for Halloween! You can find all four colours of the Festival Survival Kit on the iZ Beauty website here. Each kit is £22 and contains £28.95 worth of products.